Suspected Tamil Tiger rebels detonated a roadside bomb on Saturday, killing eight passengers on a bus and wounding 25, the Sri Lankan government said, marking the latest violence on the island. The Liberation Tigers of Tamil Eelam (LTTE) set off the blast outside the town of Vavuniya, 250 kilometres (156 miles) north of Colombo, the defence ministry said, adding a soldier was among the passengers killed. "A Claymore mine hit the bus as it was halfway through to the destination," an area military official said. "The bomb was rigged up on a tree and manually triggered as the bus passed. It was the work of the Tigers." However, the Tigers denied the charge and blamed military intelligence. 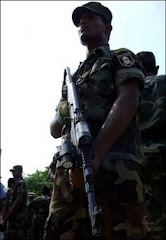 "The Sri Lankan military intelligence establishment has devised bomb attacks and wanton killings during the last two weeks with a sinister motive of tarnishing the image of the Tigers," LTTE spokesman Rasiah Ilanthiriyan was quoted as saying on the pro-rebel Tamilnet.com website. Five people were dead on arrival at Vavuniya hospital, while another three passengers later died from their injuries, a hospital official said. Seven soldiers were among those wounded, the official added. Tamilnet said the blast killed at least seven civilians and injured 25 others, including four children. The attack came five days after a bomb exploded inside a bus in the east of the island, killing 17 people and wounding 25. More than 4,000 people have been killed in the latest upsurge of violence that began in December 2005 despite a truce arranged in 2002 in the bloody ethnic conflict. The Tigers have waged a 35-year campaign for independence for the Tamil minority that has claimed more than 60,000 lives on the Sinhalese-majority island. Saturday's bus blast comes a day after Sri Lanka's navy and Tiger rebels fought a sea battle off the island's northwestern coast with the warring parties each claiming losses for the other side. Naval patrol boats engaged five Sea Tiger craft off the coastal district of Puttalam, sinking one, while the other four boats escaped, the defence ministry said. A naval craft was damaged and a sailor was hurt in the battle, it added. The Tigers denied losing any craft and said only three of their boats were involved in a 15-minute confrontation. The rebels said they sank one navy inshore patrol boat. Immediately after Saturday's blast, the government warned the public against "suspicious persons or activities" ahead of the traditional New Year next week. "The government is requesting the general public to be cautious of suspicious persons or activities, especially at crowded places, inside buses and trains during the upcoming festive season," it said in a statement. Security has also been intensified across the island's northern and eastern regions in a bid to prevent Tiger attacks, the government said.